Tame dinosaurs, conquer enemies, and create enormous structures. The Switch version of ARK: Survival Evolved will launch worldwide on November 30, developer Studio Wildcard announced. Get ready to tame dinosaurs, conquer enemies, and create enormous structures anywhere—on the couch, in bed, on a bus or even at school. Stranded on a mysterious prehistoric island, you must explore its vast biomes as you begin to hunt, harvest, craft tools, grow crops and build shelters to survive. 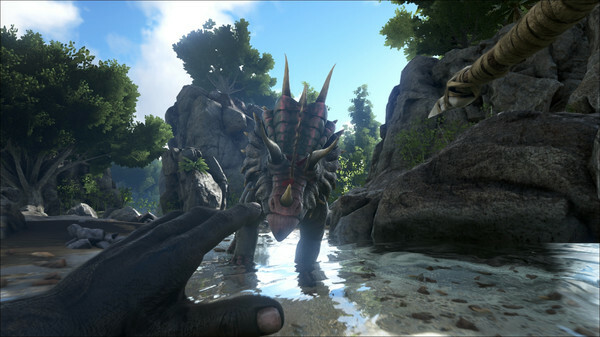 Use cunning and skill to kill, tame, breed, and even ride Dinosaurs and other primitive beasts living on The ARK. Advance your technology from primitive stone tools to T-Rex-mounted laser cannons, as you team up with hundreds of players online or enjoy a solo Jurassic experience. The adventure starts now.